Create a new document (Ctrl + N) 1200 x 600 pixels with a white #ffffff background. Select the “Ellipse Tool” (U) then drag out a big ellipse which exceeds the canvas area, we only want a small portion of the ellipse to be shown on the canvas. Label your new layer “Half Circle” then add the following layer styles. In the preview image you will notice there is a lot of small dots within the ellipse area, this is the pattern we’ll be making. Create a new document (Ctrl + N) 16 x 16 pixels, select the “Zoom Tool” (Z) then zoom in 3200%. Now Select the “Pencil Tool” (B) with a 1px black #000000 brush and replicate the image below. Once you’ve replicate the image above go to “Edit > Define Pattern”, save your pattern then head back over to your original canvas. Load a selection around your ellipse layer. To load a selection around an element click the little thumbnail inside of your desired layer whilst holding down the CTRL key on the keyboard. Once the selection has been loaded create a new layer and label it “Pattern” then select the “Fill Tool” (G), in the options panel at the top change the fill type to pattern then select your pattern from the list. Now fill (G) the loaded selection with your pattern. Once the pattern has been added to the canvas add the following layer styles to your pattern layer. Select the “Rounded Rectangle Tool” (U) with a radius of 10px (10px By Default) then drag out a rectangle about 130px by 130px. Label your new layer “Days Outer” then add the following layer styles. Duplicate your “Days Outer Layer” by right clicking the layer and going to “Duplicate Layer”. Once duplicated rename the layer “Days Inner” then right click and go to “Clear Layer Styles”. Were now going to resize the duplicated layer so go ahead and select the “Free Transform Tool” (Ctrl + T), select one of the corner anchor points then hold down “Shift and Alt” on the keyboard and drag down. Holding down the shift key and alt key on the keyboard whilst resizing the shape will resize the shape from the middle. Now add the following layer styles to the “Days Inner Layer”. Select the “Rectangular Marquee Tool” (M) then make a 1px selection across the “Day Inner” rectangle. The line should be the same width as the rectangle and 1px in height. Fill (G) the selection with the color black #000000 then move the line down 1px and then fill (G) the selection with the color white #2f2f2f. Using the “Pen Tool” (P) create a curved path from the bottom left corner over to the top right corner of the inner rectangle. Fill the path with the color white #ffffff then set the opacity to 2%. Label this new layer “Days Shine”. Finally add a number inside the inner rectangle using the color #545454 then add the word days above the outer rectangle. When adding the number to the inner rectangle make sure the layer is beneath the two colored line layer. Repeat the steps above and create 3 more rectangles, one for hours, minutes and seconds. 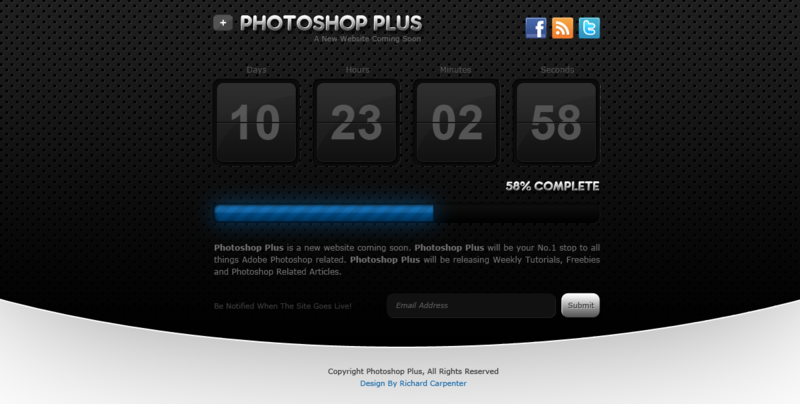 Select the “Rounded Rectangle Tool” (U) then create a small long rectangle underneath the count down timer rectangles. Label your rectangle “Progress Bar Outer” then add the following layer styles. Now select the “Rectangular Marquee Tool” (M) and make a selection across your progress bar rectangle in which we created in the previous step. Fill (G) the selection with the color white #ffffff then deselect the selection (Ctrl + D). Now load a selection around your “Progress Bar Outer” layer. Once the selection has been loaded highlight the white rectangle layer and go to “Select > Inverse” then hit the delete key on the keyboard, you should be left with something like this. Label the white inversed layer “Progress Bar” then add the following layer styles. On the progress bar we have a diagonal pattern to make this first create a new document (Ctrl + N) 25×25 pixels, select the pencil or brush (B) tool with a 1 pixel brush then replicate the image below. Once you’ve replicated the image go to “Edit > Define Pattern”, save your pattern then head back to your original canvas. Load a selection around your “Progress Bar” layer. Now select the “Paint Bucket Tool” (G) then select your pattern from pattern list, create a new layer above your “Progress Bar” layer then label the new layer “Lines Pattern”. Fill (G) the pattern inside the selection then set the opacity to 10%. To finish off the progress bar simply add a white #ffffff rectangle across the progress bar, inverse the selection like i showed you earlier then set the opacity to 8%. Select the “Text Tool” (T) then begin to add some content to the page, add a title and slogan on the top left corner then add some text underneath the progress bar. Once you’ve added some text add the following layer styles to the page title and the progress status (58% Complete). Select the “Rounded Rectangle Tool” (U) then drag out a small text field. Now add the following layer styles to your rectangle. Next to your text field add another rectangle but a lot smaller (Button Size) again using the “Round Rectangle Tool” (U). Finally label your text field and submit button then finish off the page with some social buttons. If you would like to transform this template into a working CSS template then please stay tuned, I’ll be releasing a follow up tutorial in the coming weeks. Stay up date by following Photoshop Plus on twitter, subscribe to our RSS Feeds or become a fan on facebook. Thanks for taking the time to try this tutorial, I’ll look forward to your results & comments. Look forward to Part 2 working this in CSS. its very fantastic but basic knwledge should be there.lets try. Excellent design!.. thanks for sharing! Great tutorial, mate. Got to learn how to make some simple but stunning patterns through this. Wow great outcome – can’t wait for part 2. Will you be implementing some Jquery as well? Thanks for all your comments, much appreciated. Part 2 of the tutorial will be more of a guide than a tutorial and wont include any jquery coding unfortunetly. BUT i have added some scripts for you to use. You’ll just have to wait and see tomorrow. i will definetly be releasing more detailed PSD Conversion tutorials in the future. Once again a great Tut, many thanks. Great, Richard you have done a excellent work.waiting for more tutorials. How to do that pattern?! I did it, it wasn’t that hard being a beginner, thanks Richard, you’re a Genius! Well, just try to find some tutorials in things that you want and you love to do and start working on them little by little on your pace, at the beginning you’ll be following the tutorials letter by letter ignoring why you’re doing this or that, by after a while you’ll understand the principals by seeing the results and then you’ll be applying you own ones, so practice makes perfect that’s it. Excellent work. If you can put the code or some directions how to code the countdown will be perfect!!! would create that same pattern for something half the size? I have tried everything and cant seem to keep the proportions. Thanks for tut … I follow your instructions, but results were not as expected. Thank you! I just added your site for the blogroll. Meow!